Richly-bred mare Naiya Franco was able to turn her form around second-up in the Morrisons Saddlery & Feed Mobile Pace at Oamaru on Tuesday, January 8. The daughter of Mach Three and top mare Nearea Franco (1:54.4, 11 wins & $441,361) made the most of a suitable race for her rating, and a positive drive from Samantha Ottley from the eight gate. Overport Lodge driver, Samantha Ottley. Eased to second last, Sam had her on the move three wide from the 800m to be parked at the 600m. They were left in front when front-running Chief Kapai compounded before the 400m and proved too classy, holding by 1 1/4 lengths in a 1:58.8 rate for the 2000m. 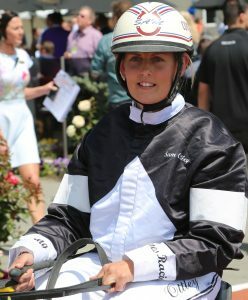 Naiya Franco is unbeaten in two starts at Oamaru, having won her maiden at the same track on June 17. Put aside after four winter starts, which resulted in two seconds, she was at false odds on Tuesday, starting the seventh favourite in the 10-horse field. Raced by Gold Coast owner, Mark Denyer, Naiya Franco is a half-sister to former top Australian mare Nike Franco (1:48.1, USA). The connection to Nike Franco was the major drawcard for Mr Denyer to secure Naiya Franco at the NZ Premier Yearling Sales for $70,000, as he has many of his horses trained in Victoria by Dean Braun. Nike Franco won 18 of 33 Australian starts for $392,000 for Victorian trainer Dean Braun, and has since racked up another 12 USA wins, taking her career earnings to $848,561. Mr Denyer co-owns top Australian mare in Carlas Pixel, a daughter of Courage Under Fire, who has been trained for much of her career by Braun. Carlas Pixel, who won last year’s Group One Ladyship Mile at Menangle in 1:49.5, beating NZ mares, Delishka, Rocker Band and A Piccadilly Princess, when briefly trained by Emma Stewart, has won 18 of 58 starts for $415,128. Naiya Franco has the breeding to develop further. Her grand-dam No Paba is an Abercrombie race-winning sister or half-sister to 12 individual winners including former champion racehorse Beach Towel (p3, 1:50), a former Meadowlands Pace and Breeders Crown winner, and US Horse Of The Year.